Morgan and I spent Saturday morning biking the L.A. aqueduct over by the 5 freeway. It's was almost like an outing to zoo because there were so many species of birds that were nesting in the watery brush. Afterwards, we treated ourselves to a mango and chile paleta (Mexican popsicle) from a street vendor. It was seriously one of the best popsicles I have ever had. I might try to make some for when it gets even hotter. For lunch, we were craving steamed buns so we ventured over to China Town. One almond milk tea and a bootleg movie later, we found a place that had the buns we were looking for. We also got an order of the sui mai pork dumplings. 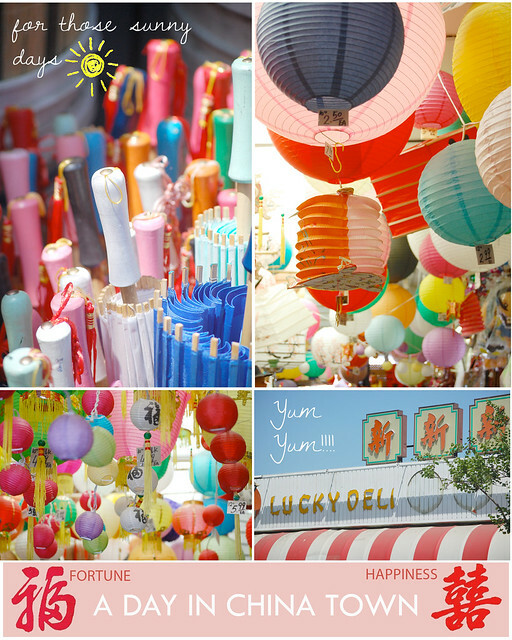 While strolling the busy streets, I couldn't help but notice the brightly colored parasols and lanterns strung up. They were so pretty I had to snap a few photos of them! How was everyone else's weekend?